So much of this trip has been about food. Dancers of course must eat. So must the rest of us. 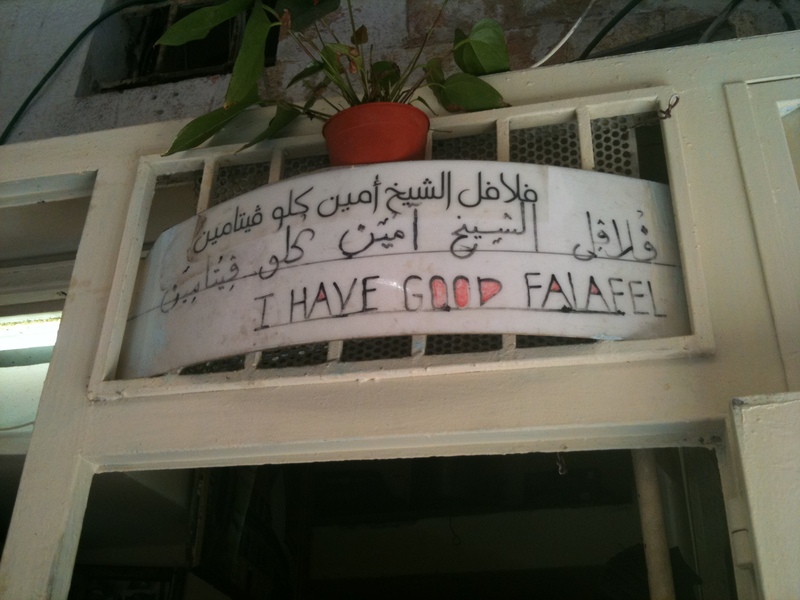 This noon Emma, Andrea, Marcie and I walked over to the Old City to find some falafel which we eventually did, under the sign above. Personally I am not enamored of the Old City as it’s crowded, people are rude and out of touch with themselves in space (hence a lot of jostling and clogged passageways that are narrow to begin with), and the sheer volume of religious souvenirs is plenty with which to grasp the story of Jesus and the moneychangers. I found the Arab quarter with the most energy and life. 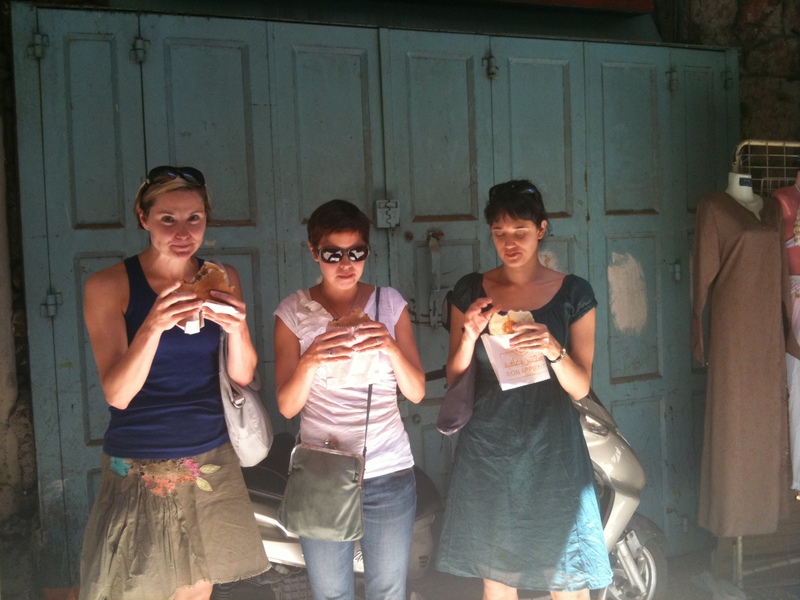 That is where we found our falafel on Shabbat, when pretty much the whole city closes up. Mind you they drop things like french fries and potato chips into the pita pockets that also contain the falafel and cabbage, lettuce, pickles….throw in some spices and perhaps some hummus and you’ve got a meal that’ll really stick to your ribs. Attempting to summarize this journey is impossible. I’ve been so busy that there’s been no way to make notes in the handwritten journal much less blog. Encountering the klezmer band in the walkway at Mamilla Mall at the start of Shabbot. Walking through Masada and floating on The Dead Sea. The company performing at Sherover Theater and discovering at the last minute that one of the drops was stuck in the flyspace so they had to dance in front of one drop rather than the usual transition from one to the other midway through the dance. Visiting Tel Aviv twice, once to explore the ancient port of Jaffa and swim in the Mediterranean and dine with the marvelous Gappel family; the second time to dine at The Salon, star restaurant of Israel’s most famous chef, Eyal Shani. A few days later, Shani’s “Chance Brunch” at the Israel Museum, a fundraiser for the Jerusalem Season of Culture, one of our host organizations. Dining al fresco at the home of two Israeli academics, the Rokems, and feasting on broiled grouper in tahini and pasta with sundried tomatoes and poached zucchini with dill. 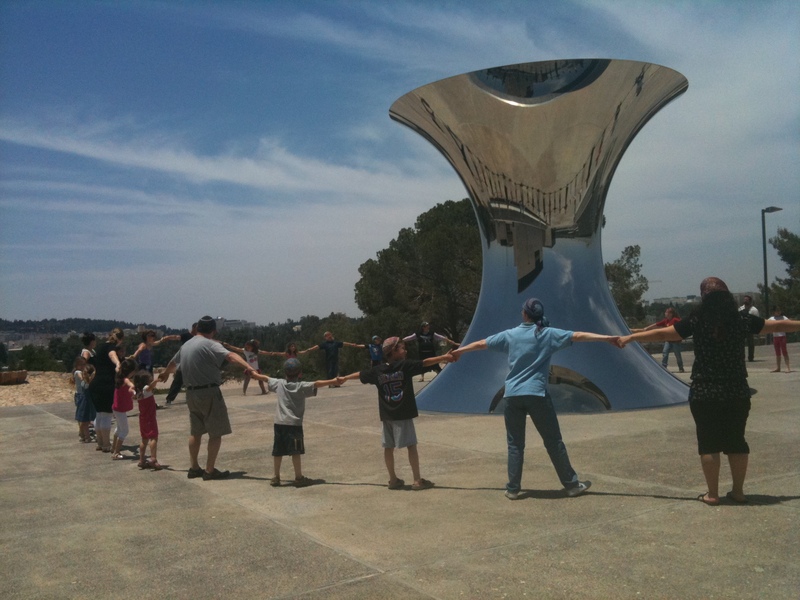 Watching children dance in front of the spectacular Anish Kapoor sculpture Heavenly City on the grounds of the Israel Museum, and wandering the Noguchi-designed sculpture garden on the same 20 acre campus, the scent of jasmine wafting through the air. Tonight we finish, tomorrow the company travels on to Moscow and I return to the U.S. of A. More reflections on Israel then. Perhaps. 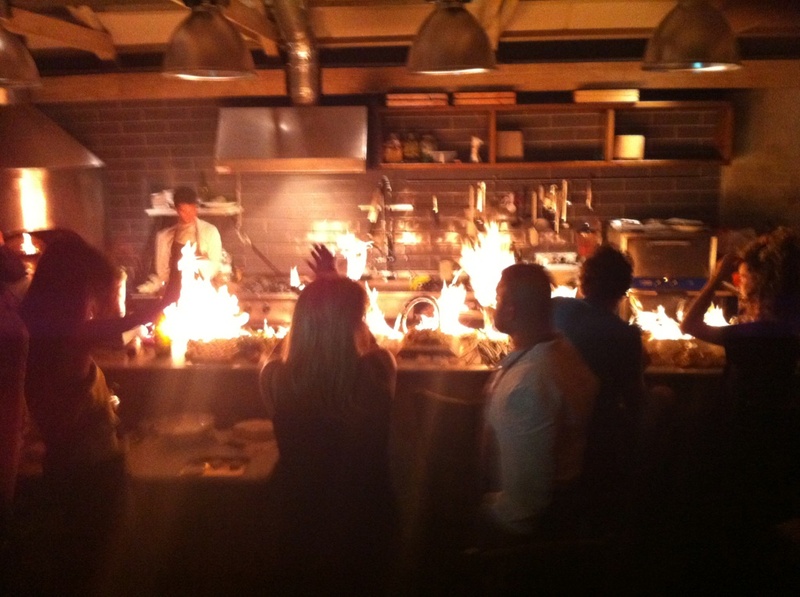 I did enjoy a contemporary version of a burning bush at The Salon, when the chef’s countertop was purified by fire after all of the chopping and cooking was done. 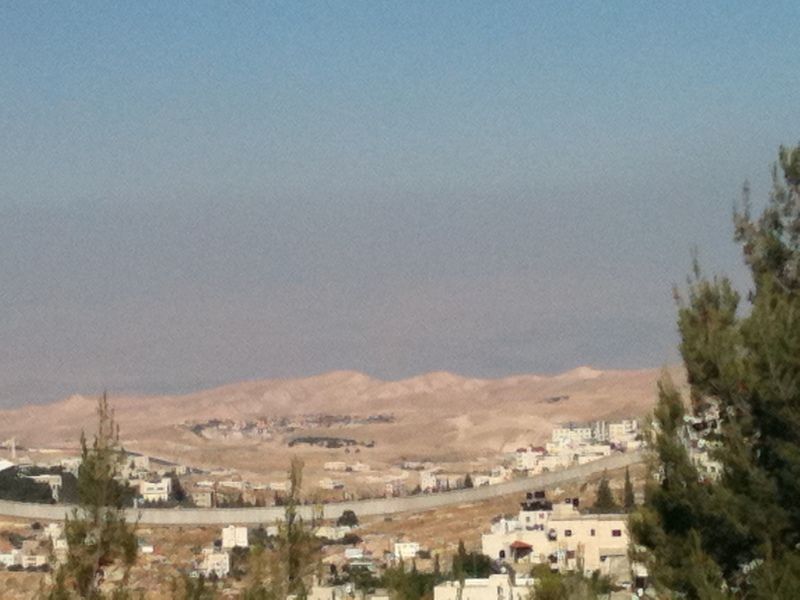 An Israeli settlement in the distance on the West Bank, the Wall in the foreground. Upon arrival here on Tuesday afternoon (it is now Thursday), I felt nothing but a sense of wonder at being here. I still feel it. Mind you this is not a romanticized sense of wonder, for it’s impossible to be here for more than a few minutes without gaining an awareness of the contradictions, complexities and confusions of this churning, ancient, modern city of so many oft-colliding cultures and ideologies. Driving from the Ben Gurion Airport, the barbed wire along the roadways and the occasional check-points and armed towers overlooking Arab territories illustrate how fraught conditions can suddenly become. Yesterday afternoon one of our hosts at the Jerusalem Season of Culture, David, took my travel mate Trevor and me to the Goldman Promenade on a ridge south of the Old City. It’s not the popular promenade for a romantic view of Jerusalem. It’s a less-traveled and more telling view, that shows not just the Old City with its radiant pale walls and gleaming gold Dome of the Rock, the forested Mount of Olives rising on the hill to the north, but also the under-developed Arab village on the eastern hillside and in the dusty wadi below, and the long, tall Wall built by the Israelis on West Bank, on the theory that this would facilitate suppression of incoming Palestinian suicide bombers. Jewish settlements, flagged by their red tiled rooftops, are visible distant on the West Bank. Further north and west you can see the Galilean desert, the Dead Sea to the south, and on its far side, Jordan. Behind the Old City loom the tall buildings and cranes of the modern city on the hill. If you are there at a time of day of Islamic prayers, you hear the call to prayer piercing across the wadi. You cannot walk a block even in the modern city without encountering the haredi — the ultraorthodox Jews that represent the most conservative branch of Judaism and represent a third of the population of the capital. “They only study and have children,” one person remarked as we drove to an outdoor event last night. “So I pay for their children and mine.” Several had been on my flight; I watched as one gathered his minion of men in black to chant prayers in the airport lobby at Newark before we boarded. Nearby, an Arab family with four children sat under a flat screen monitor broadcasting CNN. The young woman who met me at the airport asked, as we drove to Jerusalem, “were you afraid to come to Israel?” I answered, “I can’t say I didn’t think about the possibility that anything could happen at any moment here…but that wasn’t going to stop me.” She smiled and answered, “Good.” She is a sabra, born here. I’ve met many others who immigrated from the U.S, each with stories of how they came and why they stayed. Most say things like “I meant to stay for two months. That was 24 years ago,” or, “the first time I came to study for six weeks, and I knew I would come back and stay.” It sounds like a calling. The wonder continues, as do the fish dinners and the falafels and the gallery visits and walks through the market (I saw, yesterday, the Iraqi Market where men gather to drink tea, smoke, and play backgammon all day long, throwing their die in the uniquely “Jerusalem way” with a special flick of the wrist). I visually study the black haredi hats on ultraorthodox heads after learning from David that the different families have different hats, where the brim size may differ or the crown have its distinct shape. “They must wear what their grandfathers wore, and their grandfathers before them,” he explained. I relish the sunshine, the Los Angeles-like weather, the constant patter of Hebrew on the street, the passion and energy of our kind hosts. Conundrum upon conundrum. Ireland has always held mythological status in our family. “The old country,” my grandmother used to call it. (Her mother was Bridget Flanagan.) Like many Americans I still have distant cousins here, mostly in the west of the country. “Ah yes,” one Irishman said to me yesterday. “I would’ve said your people are from the west. You look it. Shannon?” Yes, I said. They’re from near Shannon. Yes indeed, as long as I say nothing, I pass. It is rather astonishing to be in the place rather than the idea after hearing so long of the idea of the place. I arrived yesterday morning in an astonishingly dense fog, after seven or so interminable hours on an Aer Lingus flight from Chicago. At least it was non-stop, with no volcanic ash disrupting plans. Jet lag is of course brutal for the first 24 hours (I love the Japanese phrase for this, “jisa boke,” which is translated “time dumbness.”). You crash, you get up disoriented, you walk for a bit, you think you are going to go to sleep again but discover you can’t, you (in my case) end up in a theater and try to watch dancing and end up battling going to sleep…and so it goes. But on Day Two the brain starts to re-organize and things begin to improve. 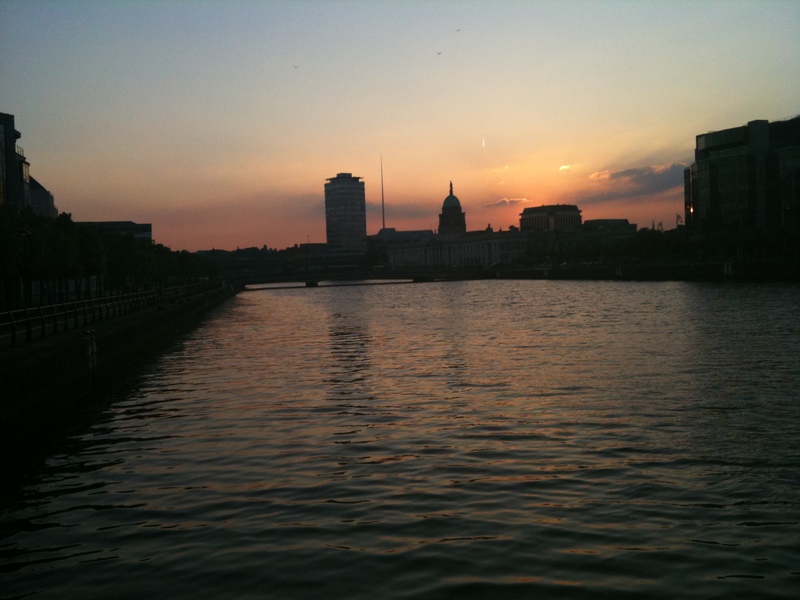 And Dublin is easy to fall in love with. Especially on two unbroken days of warm spring sunshine. The reason for this trip is attending the closing weekend of the Dublin Dance Festival, a marvelous three-week program of modern and contemporary and experimental dance that occurs here every May. So far I have seen four presentations (including two mixed-bill programs featuring Ireland-based choreographers and dancers), most recently the beautiful Jean Butler (of Riverdance fame) in a Tere O’Connor work entitled “Day.” Butler is wildly famous here, and her departure from traditional Irish dance to work with a very postmodern choreographer in the American O’Connor was described to me this afternoon as “like Baryshnikov leaving classical ballet to do postmodern dancing.” The 40 minute solo was beautifully performed (she wore a deep sapphire blue dress, her strawberry blonde hair in a bun on her head) and demonstrated those signature elements in Tere’s work, the pauses to reflect, the sudden spurts of action punctuated by elongated gesture, the luxurious drops into the floor, the looping shifts in rhythm. I won’t give it a total rave as I am always somewhat perplexed by his more recent choreography and this work was no exception. The “but” is that with a performer of this quality and nuance, who cares whether I can make sense of the dance as a whole. Furthermore, I find the provocation of the often-disjunctive phrasing in Tere’s work stimulating. So, pearls to them both, especially Ms. Butler, for plunging bravely into a different movement world. Yesterday afternoon’s Irish showcase included a duet by one of Ireland’s pre-eminent modern dance choreographers, John Scott, with strong, touching performances by American dancers Marc Mann and Michael Snipe. “ACTIONS” is exactly that, and is a duet that should be seen over and over as it shifts and changes with each performance. The two men work together and independent of one another in this process-oriented dance, offering up a study that smartly blurs the lines between rehearsal and performance. More pearls. It’s a pearly sort of weekend. The problem with starting an entry and forgetting to finish it is, information and memory slippage sets in and without your notes (which mysteriously ended up in the trash on the day the cleaning ladies visited) you can’t make the considered entry you intended. Oh well. This is what I started, which I will now try to finish. It won’t be as good or detailed as it would have been if I’d managed to do this when I meant to. Eh. On Easter Sunday I went to the Cathedral of The Great Outdoors for a hike with my friend Susan, who is visiting from California on a teaching residency. We drove 90 minutes southwest to Utica, IL, a town of 1,000 which sits, amongst grain elevators, on the Illinois River. 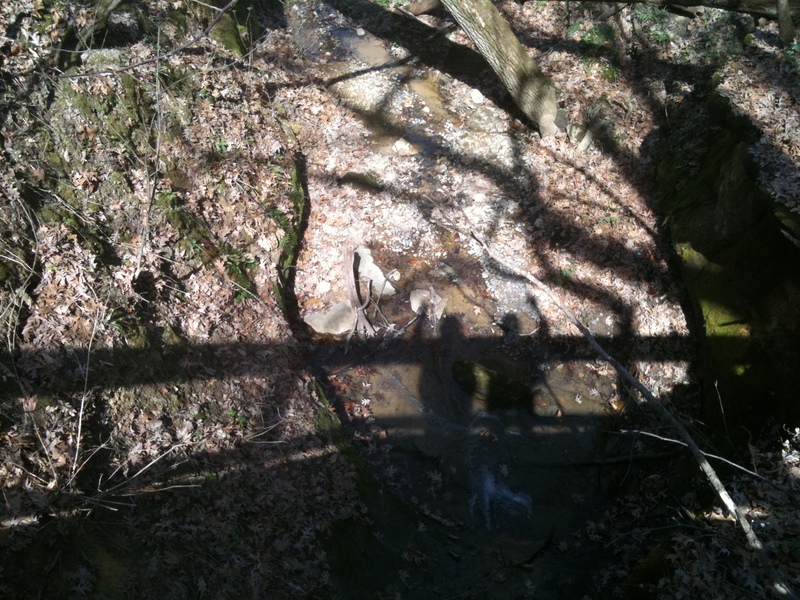 Across the Illinois is a large state park that runs for some miles along the river and inland, featuring a series of sandstone bluffs and outcroppings, small canyons and waterfalls, forested paths, tiny riverbank coves, and a lot of stairs. Yes, stairs. It is a state park after all. It being early spring, the forest floor was carpeted in some areas with new green growth and purple and white wildflowers. Susan dubbed the shade of pale dots of color on the tree branches “Early Green,” which we later revised to “Early Spring.” We walked and climbed for two hours and covered close to four miles in the interior route (passing through canyons and gazing down steep, stony gullies) and the exterior river path. Mud. We spied a nuthatch, numerous squirrels, a hawk, and what we believe was a bald eagle in the distant sky, eagles having returned to the region to nest in the bluffs. The park is dog-friendly, which afforded many canine encounters including Esther and Sylvia, a pair of enormous golden retrievers who loved climbing the hills about as much as we did. Well. Knees are knees, after all.